Bright, energy efficient and more durable than standard incandescent bulbs, LED tail lights are the way to go. Replace your stock tail lights with the clear lenses of this LED tail light that provide bright red taillight and brake light function with integrated white reverse lights. Includes required relay for backup light and wire harness. Easy plug in installation. 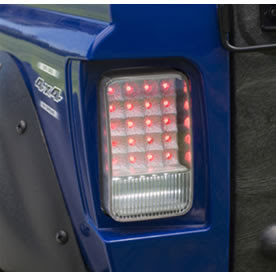 There's an LED tail light coming soon for '05-'07 Rhino 660, '06 Rhino 450. Stay tuned and we'll keep you posted. View our microfiche for Yamaha Rhino parts.